In 2011 we came up with the idea of building a climate home with a very low environmental impact, completely from plastered wood, with low-temperature underfloor heating, natural wood windows and doors, the collection and recycling of rain water, walls with organic and hypoallergenic paint, solar panels and a big heat pump for central heating. Day after day we saw our big, spacious and elegant agritourist rise out of those ancient and silent stones. Our apartments with terracotta tiled flooring, ceilings with exposed beams, waxed-finishing furnishings, bright rooms and Wi-Fi throughout. Yet no television. Every apartment comes with a dishwasher, but we decided to centralize our laundry service - which is completely free - in order to partly reduce our environmental impact. What’s more, for breakfast you will always find organic honey and homemade jams, all made by us. You will find this lovely and bright apartment that spreads over 48 square meters on the first floor, looking out to the garden and the Fragolino grape trellis. It has been furnished in shades of green with Florentine handcrafted furnishings. It has a double bed, which can be divided into two single beds, and a French-sized sofa bed. Inside you will find: kitchenette with two burners, electric oven, fridge, pans and dishware for 8 people, dishwasher, coffee machine, mixer, centrifuge, electric water heater, filter water jug, bathroom with bathtub and shower, double sink, bidet and hair dryer. You will also find an ironing board with an iron, clothing horse, bed linen, kitchen cloths and bath and beach towels in the apartment. You can also add a third bed and a crib. What’s more, there is a deck chair, beach umbrellas, loungers and a table under the trellis in the garden. A branch of my family comes from Framura and on 2000 my husband and I decided to build here our home, far from the town where we leaved and far from a chaotic lifestyle .On 2010, as a next step we built an ecofriendly guesthouse close to our home. We enjoy to share the beauty of this place and our own experience with other people. Our project of hospitality tries to respect nature and culture. We believe this is the great lesson of the ancestors. Framura is far from the crowds and the stress, even if it is easy to reach by car or by train and it is in a 'strategic' position in between Portofino and Cinque Terre. The village has a traditional and friendly atmosphere and it is not touristic. We have a policeman, a priest, an ambulance, a primary school, a library, a pharmacy, some bars and restaurant, a place to rent bikes, wonderful footpaths and beaches, a train station, a small bus, a pizzeria, three grocers and a butcher. Everything is the perfect size for the human beings. Our property is large and it surrounds two houses, one of them is the guesthouse. We have two springs and the gentlest and fresh breeze from the sea to enjoy the garden in Summer. The decision of moving here has completely changed our life and our relation with the nature. We became 'farmer' and now we produce our own wine, vegetables, honey, marmalades, olive oil, fruits, bread etc. In Framura we discovered the sea at the sunrise and the cold and invigorating water of a stream. Now we know how silence is in a night and how magic is the moonlight. We have found new friends in the village and in between our guests and we have understood that a guest house is a wonderful chance to travel, without travel! We hope to be able to share with you some of these feeling and not only a place. The flat is all made of wood and very peaceful. We hope that Laghello could be for you the right place to recover and explore Liguria. Roomy and confortable with tub/shower, bidet, lavabo and hairdryer provided. 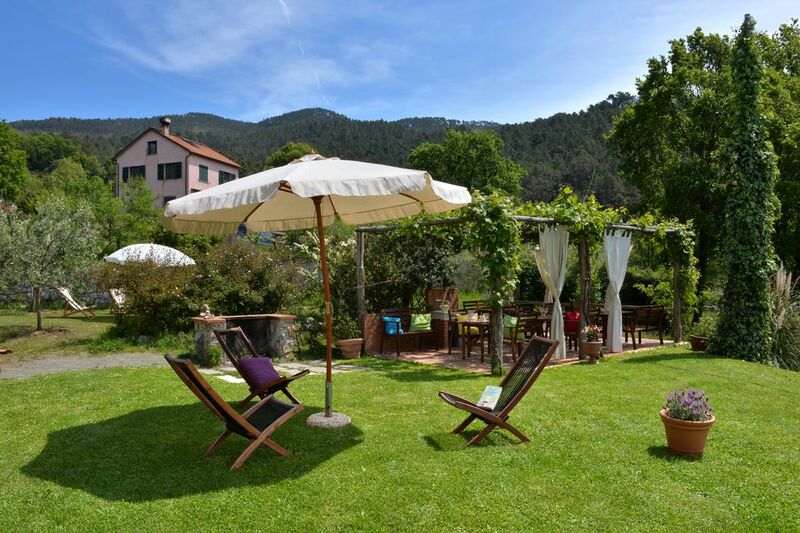 The guesthouse is also surrounded by a lush garden, trees, vineyards, fruits and vegetables. We also produce honey. In clear days, when the sea looks like a lake, you can see the French Alps. The Apennines instead protects our farm from the northern winds, linking us to the Cinque Terre (5min by train). We are on a panoramic hill that overlooks the sea and the valley, refreshed by a gentle breeze from the sea. All around olive trees, vineyards, fruits and vegetables garden. Peace and silence. The kitchen is very well equipped: blender, hobs, dishwasher, coffee machine, fridge with freezer, electric oven, cleaning water filter, kettle. Framura is exactly located on the historical border between La Spezia and Genoa, so that it has fortifications and medieval towers which were built to defend its territory. Here you can find signs of many different ages, from the roman one to the medieval one. The center of the village is wonderful, with its small lanes, hidden gardens and terraces overlooking the sea. Furthermore, in this beautiful location, you will find small and traditional food shops that sell all the local products. In the small square there is a quiet bar, where in the evening people use to have a glass of wine and chat, while children play nearby. In summertime you will also enjoy the beautiful and unspoiled sea of Framura, sunbath on its beautiful beaches or taking part to the boat trips, departing from the small, romantic port of the village, reaching the most hidden and amazing places of the coast. Highlight of our stay! Lilia and Guido were wonderful hosts. The property was peaceful, lovely and her homemade gnocchi was amazing! We wish we would’ve stayed there longer on our trip to Italy. I can’t thank you enough. It was definitely a blessing. Thank you again Lilia! Mark, Kristin, and Lindsey Kells. The property was so beautiful and Lilia was so helpful and very friendly. We truly enjoyed our stay and we will recommend to our friends if they want to come to the Cinque Terre area! Just got back from 10 days in Italy. There were may legs of this trip but the part to this region and staying at this house was our favorite! The hosts were so helpful and kind. We were given homemade jam and honey upon arrival and Lilly made us a wonderful meal of pesto and Gnocchi as "a welcome" gift. She sat with us and went over the local map and made sure we knew where we were going. The drive to the train to go to Cinque Terre was breath taking. The house was spotless and the craftsmanship of the woodwork in the home (doors, ceiling) was impressive. Such a peacful part of the country. Beautiful Property. Wonderful and relaxing setting. This was an absolutely wonderful experience. Lilia was THE best hostess. Our 5 year old referred to her as "our sweet lady." She was so accommodating and helpful. She recommended great local locations that made us feel like locals. The property was beautiful and well maintained. It came with a jar of their local honey as well as some fruit marmalade which were both delicious. My only regret is not being able to enjoy the property more. Eating out on our personal patio table and relaxing in the serene setting would have been great. The absolute best part of this property is definitely Lilia though. She was full of local information and made sure we made it to and from the train station everyday. I will be staying here again if the opportunity presents itself. Peace and quiet yet so close to Cinque Terra. Our farm stay with Lille was above expections. Our room was charming and Lille is such a wonderful person. She will answer all your questions. She speaks English. If you like to hike or bike, there is a one-of-a-kind tunnel that begins in Frumura and continues for miles along the coast. It's flat, no hills to climb. We took the train to the villages of Cinque Terra and paid 13 Euros for the entire day, exploring at our leisure. Would come back to her farm again on any future trip. I read the reviews posted by others, so I knew before getting to Framura that this was going to be good; it was great. Lilia was so nice and inviting in her responses to my inquiries. She and Quido are so nice. The farm and the apartments are lovely. The apartment, one of six in a separate building from the farmhouse, is spacious, modern and very large. It would be fine for an extended stay. The hilly terrain is beautiful. Since we did not have a car, my only concern was about getting to the trains and back. Just as they said, they were happy to drop us off and arrange pickups. A few times they drove us to a village called Costa and we walked down to the train station or bike trail in Framura. This was a wonderful downhill walk that takes about 40 minutes and is very scenic. After travels to the Cinque Terre or Portofino, we would take the train back to Deiva Marina and call them. They would pick us up a local bar (Bar Serena), where we came to feel like regulars. Don't pass up the opportunity to have Lilia cook for you. The entrees she prepared were the equal of a fine restaurants. After full days of activity touring, hiking or biking, returning to the farm and apartment was perfect. What a nice counterpoint to the crowded Cinque Terre and the hustle-bustle of Rome and Florence. Lilia and Quido, thank you for your hospitality and a memorable stay in Framura. We wish you continued success with this fine example of agro-tourism. Liguria is an area of mountainous land along the North West coast in Italy. On one side it borders Tuscany then it curves towards France’s Cote d’Azur. This area is as small as full of history and antique. In the last century this corner of Paradise was the favorite haunt of English poets, like Shelley and Byron, Lawrance and Pound. There are in fact two Rivieras and Framura is part of the spectacular Riviera di Levante, with Cinque Terre, Portofino, Santa Margherita Ligure. This area is reach in memorable panorama and roads. Framura is exactly located on the historical border between La Spezia and Genoa, so that it has fortifications and medieval towers which were built to defend its territory. Here you can find signs of many different ages, from the roman one to the medieval one. The center of the village is wonderful, with its small lanes, hidden gardens and terraces overlooking the sea. Furthermore, in this beautiful location, you will find small and traditional food shops that sell all the local products. In the small square there is a quiet bar, where in the evening people use to have a glass of wine and chat, while children play nearby. In summertime you will also enjoy the beautiful and unspoiled sea of Framura, sunbath on its beautiful beaches or taking part to the boat trips, departing from the small, romantic port of the village, reaching the most hidden and amazing places of the coast. On the 10th of August here takes place the typical local fest to celebrate the night of San Lorenzo. On this day, people use to meet in the streets and squares to eat together and dance. During another fest, at midnight people light a great number of small candles and set them out into the sea. To watch them floating away is really impressive. Many open air markets are held every day in this area. Nearby there is the famous National Park of Cinque Terre where you will find many breathtaking paths and some of the most beautiful beaches in Italy. Moreover, by boat or by train you can easily reach Portofino, Portovenere, Chiavari, Sestri Levante, Santa Margherita Ligure and Genoa with its museums, the famous aquarium, some UNESCO world heritage sites and a well-known Opera House as well as the most fashionable shops. From here it will take just about two hours by train to reach Pisa, and less than an hour to reach Sarzana, a beautiful medieval town. To go to Firenze takes about 3 hours. To visit Busseto, the home town of Giuseppe Verdi, the drive takes about 2 hours and to reach the Langhe vineyards hills in Piemonte it takes about 2 hours. By train, it is very nice to explore the coastline as it runs all along the sea. To reach the Nice Airport takes 3,30 hours by car, a little bit more by train. Liguria is also well known for the seafood and for the simple but very tasting, typical vegetarian dishes. It will be a pleasure to introduce you to all the secrets of this magic land, where people to grow grapes and olives had to carry the soil by boat or by their backs and stick it to the rock face, creating a style of terrace agriculture unique in Europe and found elsewhere only in parts of China and Peru. From Framura to Levanto there is also a very special bike lane that runs all along the coast, inside and outside incredible, old train tunnels. The panorama from the open air pieces of road is breathtaking. Let Liguria shows you its beauty and secrets, enjoy your holiday with us! Touristic Tax amounts to 1,00 euro per person per day for the first 10 days of your stay.children under 10 years don't pay the touristic tax. Additional cost for the initial and final house cleaning service is already included in the price. We offer free laundry service, free Wi-Fi in the garden and inside the flat and free parking. Beddings and towels as well as beach towels are provided with no additional costs.